The most recent Guild Wars 2 release has gone live – Cutthroat Politics! Thanks to the actions of Mai Trin and the Aetherblades, there is now an opening on the Captain’s Council in Lion’s Arch, and two characters – Ellen Kiel, a high ranking member of the Lionguard, and Evon Gnashblade, leader of the Black Lion Trading Company – are both competing for the position. And we, as players, get to ultimately decide who wins the spot on the Council, by collecting support tokens and voting with them. Ellen Kiel vs. Evon Gnashblade – who do you support? It’s a pretty neat idea, especially as who you pick will change what we ultimately get in-game – Kiel is promising a waypoint cost reduction for four weeks, whereas Gnashblade will reduce the costs of Black Lion Keys for four weeks. There will also be a new fractal, depending on who wins. Kiel wants to push research into the Thaumanova Reactor, whereas Gnashblade wants to find out about the fall of Abaddon. I decided pretty quickly who I am supporting. Fractals are really not all that important to me – it isn’t content I enjoy, and I don’t do them frequently. I do not buy Black Lion Keys, as there’s enough RNG in this game and I don’t like paying for more of it. Waypoints, however, I use constantly. I have 8 characters at level 80 – those waypoint costs really add up quickly. So it wasn’t a difficult decision for me to throw my support behind Kiel. She is also, as a character, one that we know better. We’ve worked with her frequently since the Living World updates started – she was there on Southsun Cove both times there was trouble, she headed the investigation of wrong-doings at Dragon Bash, and she came with when we took on the Aetherblades. We know she’s a take-charge person. Gnashblade…well, he sits in the trading post. That’s about it. If he has any fighting experience, we’re not aware of it. If he’s ever done anything other than try and line his pockets further with our cash…we’re not aware of it. “But what about the fractals?”, you ask? Well, personally…as I said, I don’t like fractals. However, a lot of people will vote based on that. As I mentioned before, Kiel wants to research the Thaumanova Reactor, while Gnashblade wants to research the fall of Abaddon. I really think that Kiel has the edge here. Hear me out on this one. The fall of Abaddon – what caused him to be struck down as one of the Tyrian gods – would be awesome to see. I’m not saying it wouldn’t. However, when it comes to relevance to Guild Wars 2…Abaddon has next to none. He was a human god, for starters. Four of the five playable races do not even believe in him as a deity – charr actively revile the human gods, norn follow their animal spirits, asura believe in the Eternal Alchemy, and sylvari are agnostic to the existence of gods. There’s also the fact that a good deal of Guild Wars 2 players will not even know who Abaddon is meant to be, or why he would be important. Let’s be real here. 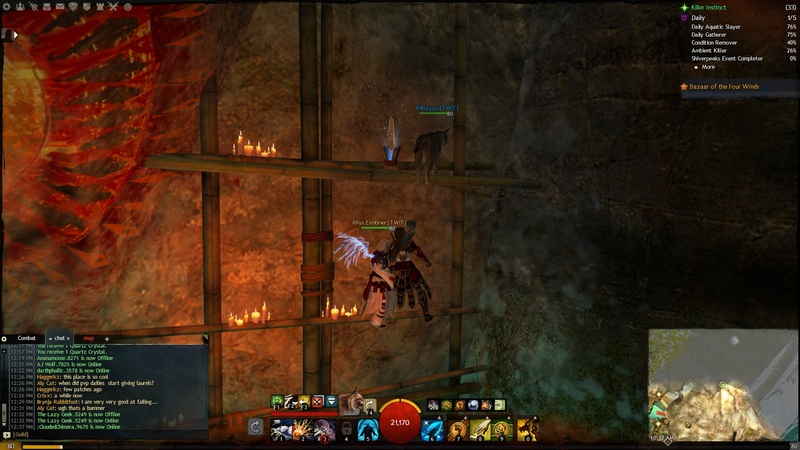 Many, if not most, Guild Wars 2 players were not players of Guild Wars 1. 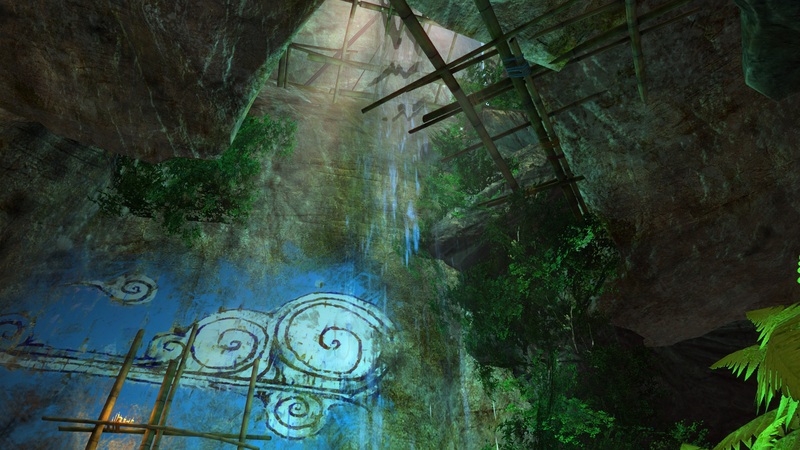 Abaddon’s only real mention in Guild Wars 2 is the underwater temple that you visit during a personal story quest. And even for the former Guild Wars 1 players, as the fall of Abaddon concerns things that happened long before the events of that game, for the most part only those who were heavily into the game’s lore (like myself, to be honest), would care how that happened. But it’s an event that is long past, and any effect it had on the world is also long in the past. Whereas the Thaumanova Reactor is something recent. The fallout of it is not even close to being taken care of, as is clearly obvious by the mess it’s made in Metrica Province. 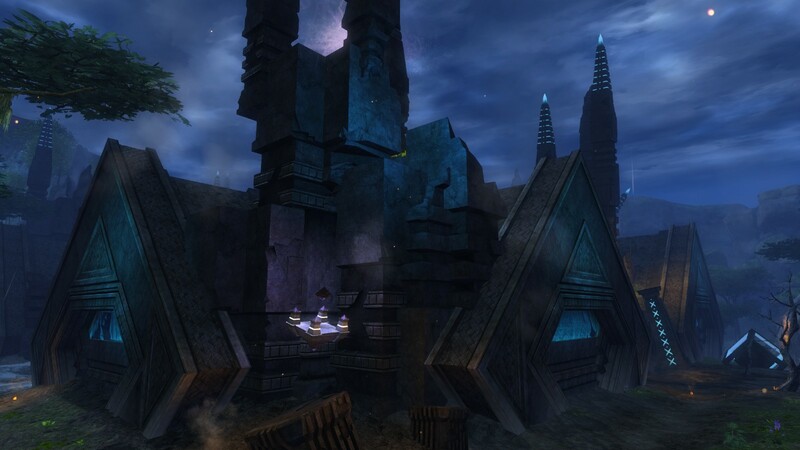 It was originally an asuran city, destroyed by Inquest experiments. The chaos energy released from the explosion there causes creatures to continuously be teleported in and out from regions all across Tyria, and effects of the experimentation have spread as far as Iron Marches, creating the Chaos Crystal Cavern jumping puzzle there. It is a recent event, it is one that has widespread effects across the continent, and it is one that is actually relevant to the events of Guild Wars 2. It is also something that is familiar to all players of Guild Wars 2, which is very important here. We all know of the mess that is located there. Most of us have fought that fire elemental at least once. And we all know that the Inquest like to poke their noses into things they really have no rights messing with. Their attempts at harnessing dragon energies have already resulted in some interesting creatures in Crucible of Eternity – just what were they getting into this time to cause all of that destruction? And what were their plans with whatever they were experimenting with? For me, it was an easy choice. 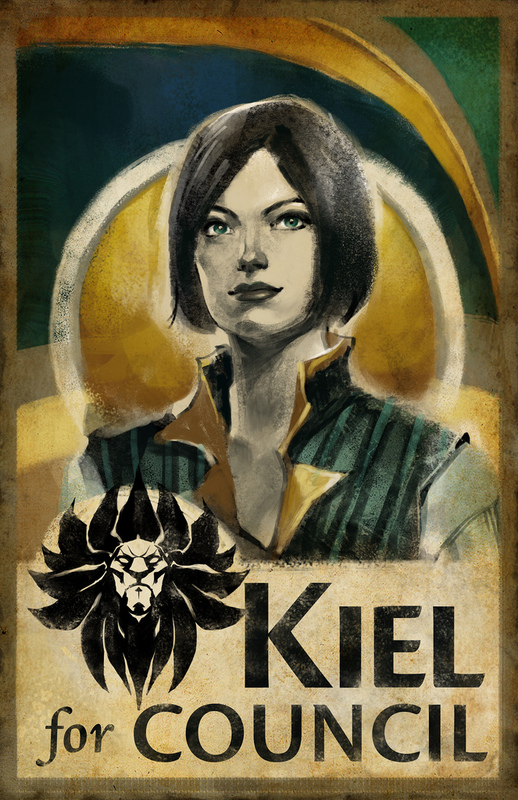 Team Kiel all the way. I love Guild Wars 1 lore, but I would really love to see Guild Wars 2 build more upon it’s own lore, as opposed to relying on the contents of the predecessor. And, y’know…cheaper waypoints. Gotta love that. So who are you voting for? Also, Kiel isn’t a selfish sort. Today we got a long-awaited blog post, letting us know where ArenaNet is taking Guild Wars 2 through the end of the year. To put it mildly, I am pleased. I’ve seen a few complaints on twitter, but for the most part, the reaction is positive, and I personally am very happy. New permanent additions to the Living World. Champion reward revamps. Dungeon reward revamps. NEW CRAFTING TIERS <3. Craftable ascended gear. CRAFTABLE PRECURSORS. New legendaries. Choose-your-own stats for legendaries. Magic Find being removed as a stat. New skills and traits. Yeah I’m not going to lie, some of those I’m more excited about than others. Crafting, guys. Craftable precursors. Come on! That’s awesome! So, permanent Living World stuff. One of my chief complaints about the move towards Living Story releases being the primary way of adding new content is that so far, nearly everything has been temporary. I am happy to see that this will not always be the case. Champion and dungeon reward revamps are a welcome change. The guaranteed blue drop for killing a champion was a start, but still not enough to really make it worth it…and there’ve been many a time where I’ve killed a champ or legendary enemy and still not even gotten that. I definitely like the new reward chests; unique skins are always welcome and it is very reminiscent of the green weapons from Guild Wars 1. Anyone working on a legendary will tell you how valuable skill points are. Crafting mats and lodestones are always useful. So in all…definitely an improvement over the guaranteed blue item. The reward change for champions is tied directly into the reward revamp for dungeons. Now, instead of a coin bonus for defeating a boss, you get one of these reward chests. You then also get a guaranteed gold bonus at the end of the dungeon path, but you only get this once a day per path, though (similar to the bonus tokens you get for completion). I like this for several reasons. If you die during a boss fight and cannot be revived, you will still get rewards. If for some reason the game decides you didn’t tag the boss enough (and sometimes it can be truly buggy in this), you still get rewards. Citadel of Flame farmers? Have to find a new hobby. It’s a minor change, but as someone who enjoys dungeons, I like it. So, crafting. I like crafting. I finished Master Crafter pretty quickly, and I’ve re-done every crafting profession at least once more (in the case of Artificer, Cooking, and Jewelcrafting…quite a few times more) in the process of leveling my alts. One of my quibbles about crafting is that there’s really not much variety in what you can make, skin-wise, and that crafting is not a viable way of making money in the game. You’re generally better off selling the raw materials and buying the items you want than crafting them yourself. Well, it appears that this will be changing. First and foremost crafting will be raised from having 400 levels to 500, adding a new tier. This new tier will allow you to craft ascended items. As I don’t really care for fractals and would rather use my laurels for other things (like kitty tonics and tier 6 materials and dye), this gives me another way to get ascended items for my characters. This gives everyone another way of doing that. And to keep it valuable, you can’t just go and craft everything ever at once, but rather there is a time-gating aspect to it. The actual armor and weapons will be account-bound, but the components can be traded. And if you don’t want to craft them yourself…ascended armor and weapons will also be available as rare drops. A pile of badges and a gift of battle…good thing there are more legendaries coming. Now. The biggest thing that made me happy. LEGENDARIES. I currently have Kudzu on my ranger. I am working on Bifrost for my mesmer. I am familiar with legendaries and the process that goes into making them and I have written about it before in detail. They are making some changes, and all are only for the better. The first is that there will be more legendary items being added. New weapons, and other types of gear (read: armor). YOU WILL BE ABLE TO CRAFT YOUR PRECURSOR. I hate precursors. They are horrible and expensive and argh. With crafting being brought up to 500, and new crafting mats being added, though, precursors will be crafted. Nothing says whether or not this replaces the scavenger hunt they had been talking about in the past, but I would guess so. Also, while out of combat? You can change the stats on your legendary. As of right now, all legendaries have Soldier stats (power/vitality/toughness)…which while not a bad combo by any means, is not ideal for every build. Right now, your choices are to deal with it (what I decided was best), or transmute it onto an exotic with the stats you want…and hope it doesn’t break your legendary and turn it into an exotic. No longer will that be the case. We’ll be able to set the stats we want while out of combat. My Kudzu will be a berserker bow at last! Oh, and never fear about the new addition of ascended weapons and armor. Legendaries will be upgraded to match ascended stats, as was promised before when ascended gear was initially introduced. The last thing I want to touch on is a change that will likely make a good number of people unhappy. Magic Find is being removed as a stat type on gear. Magic find as a whole is something I’ve always been pretty opposed to. Omnomberry Bars are great and all in the open world, but other than that, you’re simply hindering yourself with the hope that you’ll get slightly better loot. On top of that, you’re hindering the people you play with. Removing it as a stat type and turning it into something account-bound that is not tied to anything else is a good move in all ways. For starters, you can play at your full effectiveness and still get the MF boost. Second, you get that on all characters, and can use all characters to improve it. They’ll introduce some sort of system to replace magic find, which wasn’t talked about yet, but it did say in the post that it will come in the future. There were other things talked about – WvW and sPvP changes (less to my interest), new skills and traits being added as a form of progression, as well as mention of a few other things – a LFG tool and the possible removal of culling from PvE…and overall. all of it is stuff that really is great for the game and the community as a whole. I personally am excited, and pleased with everything I read in there – and that’s a rarity for me. Today the newest piece of Living World content, the Bazaar of the Four Winds, has gone live. I’ve been playing in the new map, Labyrinthine Cliffs, basically since the patch went live a few hours ago, and I have to honestly say…I love it. For all that I’d rather have a full expansion than little bits of content that’ll go away, this patch is really, really fun. New zone, new minigames…and some other neat things, too! Before I really go into the new zone, I want to point out one of the big changes made to the game. Achievements. I’ve said before that I’m not a fan of them, and that statement stands. However, due to my obsessive playing of the game, I’ve still managed to rack up nearly 7000 achievement points. Previously, these points did nothing. However, that has all changed now. Fun fact: The HOM achievements were worth 2 points each before this patch. For every 500 points that you get, you get a chest. These chests contain such items as: Laurels, money, weapon and armor skins (weapons for every thousand; armor starts at a higher point), and a chest that contains a variety of boosters, tools, and so on. And, best part, is that these chests are retroactive, meaning you’ll get one for each milestone you’ll have hit already. The only caveat to that is that it’s one per day, so if you’re like me, it’ll take a full two weeks to get them all. But I’m fine with that. Oh, and the armor and weapon skins…they aren’t one-use unlocks, like skins from the gem store. They are more like the Hall of Monuments unlocks, where you can pull them out and use them as many times as you want. There’s also the monetary reward you get for each chest – 1g per chest up to 2500 points, where it jumps up to five gold. Whether or not that’s 5g per chest past that, or 5g because it’s the fifth chest, or if there’ll be another money jump at, say, 5000 points…we don’t know yet. But in a few days we’ll find out! So. Onto the new zone and content. I’m actually surprised that I’m enjoying it as much as I am; the map is basically one big playground within a jumping puzzle with harder smaller mini-puzzles littered all over. I am not a fan of jumping puzzles, to be honest. But I’m really loving exploring this place and hunting down sky crystals (at current count: 32 crystals located). Dak and I, having located a crystal…my pet is a cheater though. Part of it is that everything is just so pretty. The zone has a very heavy Guild Wars 1 feel to it, and in particular reminds me greatly of Kaineng City from Factions. Everything is a bit shabby and run down, and while the city is a huge sprawl, it’s a largely vertical sprawl. I loved Factions. I even loved the maze that was Kaineng. So seeing that aesthetic back is very pleasing to me. Part of it is that playing with the different aspects is just plain fun. You can pick up three different aspects that give different abilities (jumping really high, speeding through things, or jumping to specific locations), that let you get into some really neat places. You can even combine aspects by using two at the same time – there was one crystal we found where we’d used #1, the Assisted Leap, and then used #2, Light Dash, at the height of the jump to dash over to the crystal. And part of it is that there’s simply new things here. You can mine quartz, and trade materials for boxes that will give you recipes to use the quartz with. If you ever wanted Celestial (all-stat) gear for your characters, now you can craft it. Completing enough achievements for this Living Story chapter will give you a quartz node in your home instance, so it won’t go away fully, like the azurite did in Flame and Frost. There are also new mini-games. I have not tried out Belcher’s Bluff yet, but I have done a couple Sanctum Sprint races, and I just have to say…Mario Kart fans, have fun. Running, jumping, picking up power ups, dropping traps for other players…following the track can be tricky (but it will get easier as you play it more), but it really is a lot of fun. I haven’t won a race yet, but in time! There are of course two quibbles I have with this. The first is waypoint costs. There are two waypoints in Labyrinthine Hills…and neither are free. As it’s not a huge zone, that’s not normally a big deal. However, you are going to die. A LOT. You will fall to your death repeatedly as you get used to using the aspects, and even more frequently getting the sky crystals. Now, luckily, fall damage does not break armor…but you will sink a lot of money into waypoints while here. They really should have done free waypoints for this zone, or at least reduced to costs to something less than the standard waypoint cost. The other is that the majority of this is temporary. Belcher’s Bluff is staying, but the rest is only here for a month. I really have to ask…why? Why create a new zone, only to take it away after a few weeks? I’d love for this place to stay forever. It’s such a lovely area, and is going to be very nostalgic for a lot of Guild Wars 2 players. Why remove it? I do hope it’ll be something where they use it again in the future…but I do really wish it would stay for good. 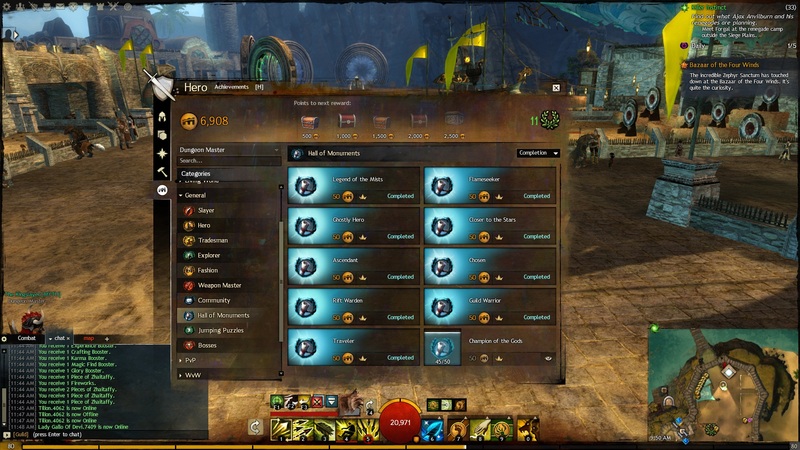 I’m going to go out on a limb here, though, and call this the best update Guild Wars 2 has seen thus far. It’s pretty, it’s fun, there’s new things added that will persist, and there’s actually a lot to do here. If this is representative of what future updates will be like…well, I’d still like to see a proper expansion, but I can live with this. Easily. And if you haven’t yet…patch your game, log in, and go play! The Living World seems to be something that ArenaNet is focusing on heavily for Guild Wars 2. And by focusing on heavily, I mean that they’re making it the main focus on the story development of the game; recently they announced that they have four different teams working on Living World content, and were going to be moving to a biweekly release schedule. This means we get new story content every other week. It’s certainly an ambitious plan, and it’s one that I think they can pull off. So right now we’re not really looking at expansions as an option…If we do this right, we will probably never do an expansion and everything will be going into this Living World strategy. So sayeth Mike Zadorojny, the lead content designer on the game. It’s an interesting possibility, but personally? I can’t say I’m too keen on it myself. For the most part, the Living Story stuff’s been pretty cool. Aetherblades hasn’t been my favorite thing ever, but that’s because it’s a combination of things I dislike in general (pirates + steampunk = zzzzzzzzzz), not because it’s bad. However. The Living World updates have, thus far, been very content light. A small bit of story, a pane of achievements, maybe a temporary dungeon. The only thing that makes it last more than one sitting is if you want to get every achievement. They’ve done a bit better with the pacing on things in the more recent updates, but the fact still stands that the actual content is over with quickly and then you’re just grinding out achievements or back to doing what you usually do. I like story. I like things to do. I do not like achievements. Basically, what I’m saying, is that I want an actual expansion, and I doubt I’m the only one. In fact, taking a look at my twitter feed right now shows that I am most certainly not the only one that’s a bit torn on this new strategy. And I have no doubts on the quality of content we’ll see; it’s simply the amount of content that has me unsure about this. We’ve seen one elder dragon. We have huge swathes of Tyria untouched. We still have Cantha and Elona to explore (okay, Cantha maybe not, but a girl can dream). Will we ever get to see these things within the Living World? I don’t know, but they feel like things that a full expansion would be needed for. And frankly, I’d prefer a full expansion’s worth of content that I can play and replay at my leisure, instead of temporary content that we’ll only ever see once. If you like a particular story and want to replay it later on an alt? Oh well, out of luck. I don’t mind temporary content in general, but I do when it’ll become the primary way of adding new content to the game. There are a lot of advantages of the Living World, but there are also a lot of downsides as well. I simply hope that, if they do keep this as their main way of adding new content and decide to pass on expansion entirely, that they’re aware of these downsides.